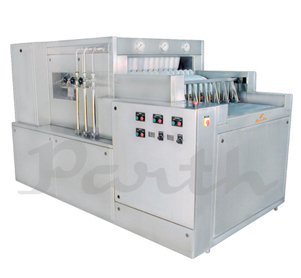 High Speed Linear Vial Washing Machine is most ideal for Round Vials and finds wide application in PHARMA INDUSTRIES. The automatic loading arrangement facilities loading of Vials on to SS wire mesh conveyor through feed conveyor or Vials are pushed manually from feed table. This saves manpower as Vials are feed into pockets automatically. The automatic unloading mechanism consists of unloading Vial continues on to Turn Table (Optional). Three-cycle rinsing allows flexibilities of various wash cycles such as fresh water, dematerialized water etc. as per the rinsing requirement of Vial. All the pumps are made of SS and all the water contact parts are made of SS 316 on a heavy base of MS structure. In tunnel design is such that separation is maintained between feeding zone and discharge zone of the cleaned containers. All the mechanical drives are separated and isolated from the washing zone. Approved materials only are used for construction, together with a careful choice of components, thereby taking in to consideration all aspects of sanitation and consequence complying with the pharmaceutical G.M.P. requirements. The quality of rinsing is ensured through 3 sets of inner and 2 sets of outer nozzles accurately placed to direct the jet at center of the Vial and the Vial comes out with water totally drained with minimum droplets of water. NOTE : * Depends on Vial size. High-pressure pump ensure proper wash of Vial. Contact parts S.S. 316 Non Contact parts S.S. 304 Including the basic frame. Suitable for Round and Flat Glass Vial (with help of change parts). Water re-cycling provided as per customer’s SOP.